Featuring new and unique footwear styles for the entire family, including shoes, sliders, flip-flops, sandals, and boots for every weather condition, Off Broadway Footwear brings together brand names from around the world and offers them all at outlet prices on their web store. Customers can also shop for a variety of footwear accessories and fashion pieces, with bags, jewelry, and inserts some of the most popular items in these sections. 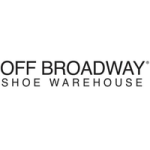 Buy One, Get One Free deals are common and usually advertise directly on the homepage, and the Sale section of the Off Broadway Footwear website is where customers can find deeply discounted shoes and accessories.